This periodic table shows the relative sizes of the atoms of each element. 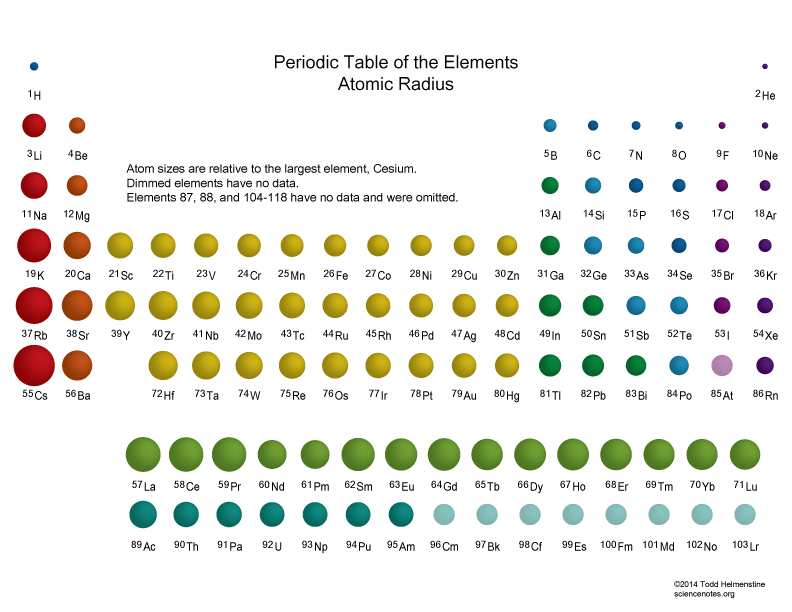 Each atom’s size is relative to the largest element, cesium. Atom size values are calculated from atomic radius data. This table shows how the atom size, and atomic radius values change as you move horizontally and vertically across the periodic table. In general, atomic radius or atom size decreases as you move from left to right. This is due to the way electrons form shells around the nucleus. Each step you move to the right on the table, the number of protons in the center increases by one. This increases the overall charge attracting the electrons towards the nucleus. The larger charge means a greater pull due to the electrostatic attraction between the positive nucleus and the negative electrons. The more pull, the tighter the electrons orbit. The other trend of atomic radius or atom size occurs as you move vertically down an element group. This direction increases the size of the atom. Again, this is due to the effective charge at the nucleus. This time, even though the number of protons increases by a lot, the electron valence shells do not. As you move down the period, more electron shells are filled. These filled shells cancel out part of the positive charge of the nucleus. This reduces the force of attraction between the outer electrons and the nucleus and the electron orbits are larger. A PDF version of this table is available for printing. For best results, choose Landscape as your printing option. This table was optimized to fit on a single sheet of standard 8½x11 piece of paper. Check out Periodic Table Trends for more information about other trends that appear in the periodic table. Cotton, F. A.; Wilkinson, G. (1988). Advanced Inorganic Chemistry (5th ed.). E. Clementi, D.L.Raimondi,, W.P. Reinhardt (1967). “Atomic Screening Constants from SCF Functions. II. Atoms with 37 to 86 Electrons”. Journal of Chemical Physics. 47: 1300.